Since early July, the next version of Inbox Foto was introduced, completing the global update of the design project. All product pages now share the same size, view, and navigation. Significant changes in the latest update have affected the viewing page of the selected images in the album – the information has been grouped into two top menu items: “Edit” and “Preferences”. Also, a special place was designated for effects. By default, applicable effects are now hidden under the title “Effects.” A unified design was applied for all effects’ windows. 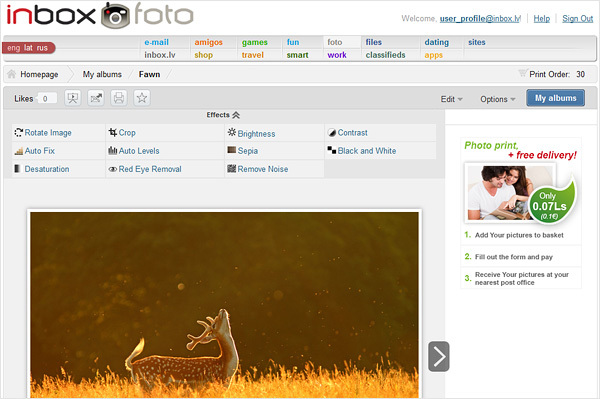 The most popular actions for photos, such as a “slide show”, “send a photo to a friend”, “send to print” and “add to favorites”, have been allocated to individual icons. Under the photo, as before, are the author’s description of the photo, comments of other users, as well as data on the number of views, the original file name and other useful information. You can vote with the green button “Like”. When viewing any photo, a panel with a list of all the photos in this album will be displayed at the bottom of the screen. The new Inbox Foto version features some improvements in the product. We have fixed the work process of “Download original” option. Now the action offers to download the original picture without the applied effects. Also, the processing speed of archived files and FTP-uploaded files was increased. Design changes affected the following pages: “Favorites”, “Print orders,” new photos’ upload fields and pages with saved mail attachments. In case You cannot find familiar features of Inbox Foto after the changes – please visit the “Help” section or send Your question to the technical support: feedback@inbox.lv. We will surely help You! We are grateful for the positive feedback and for suggestions. We hope the new design will ease the work and will appeal to everyone.